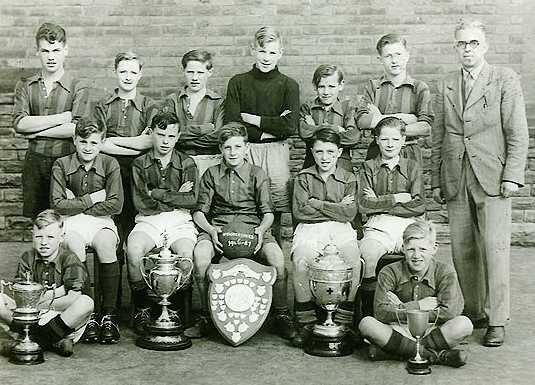 Woodlesford School football team and their trophies from the 1946 – 47 season. Back row: Collin Ellis, John Alderson, Terry Hollis, Terry Parkinson, David Bickerdike, Kenny Biggs, teacher Alfred W. Howells. Middle row: Harry Dennison, John Naylor, Roy Abbishaw, Terry Joyce, Cyril East. Front row: Dickie Hughes, John Atkinson.